Could you briefly describe AIDA? AIDA: AIDA (Ayuda, Intercambio y Desarrollo) stands for “Help, Exchange and Development” and is a NGO that has been working since 1999 in the development and improvement of the quality of life of some of the poorest areas in the world. Declared as a Public Utility organization in 2004, AIDA has been working on projects of economic, human and cultural development; offering its aid and services in 12 countries of Latin America, Asia, the Middle East and Africa. The work is mainly done through cooperation projects for development and thanks to the help of several professional experts. What are the major challenges of Spanish NGOs? AIDA: In the last few years, the biggest challenge has been the transition to a professional sector. The ongoing process has taken place inside the institutions but has involved convincing society of the need of a more professional way of doing things. The financial crisis is also a big issue; it has made the process of professionalism and collaboration more difficult by making access to public and private funds more challenging. This makes it difficult to maintain projects and to be able to develop them in the way they were originally stated. Altogether, it makes executing organizations’ objectives very difficult. Which role do NGOs play in the online space? AIDA: From our point of view, a great part of society uses online media to get information about the work and the need of NGOs. Organizations are using more and more tools online to increase the awareness of their activities, since it can be faster, cheaper and more efficient than traditional media. How has Google Grants impacted your organization? AIDA: In our case, Google Grants has been crucial because it has connected people looking for our service with our organization online. People interested in our services are able to reach us in a fast and easy way. How long have you been part of Google Grants and how did you hear about the program? AIDA: AIDA has been a member of Google Grants since July 2010. We knew about AdWords because of it’s importance in the sector of online communication and advertising. We found out about Google Grants through a volunteer of our NGO. How has AIDA benefited from Google Grants? AIDA: Google Grants has made it easier to find volunteers and employees for our institution and has increased both material and economic donations for our projects. We have also received several collaboration propositions, kind feedback on our activities and projects, and there has been an overall increase in awareness of our initiatives. Could you give us a more specific example of how Google Grants has helped your NGO? AIDA: AIDA Books & More is an online library through which we sell used books that have been donated by companies and individuals. All the collected money is then used to finance our aid projects. Thanks to our Google Grants ads, the donations to this project have increased significantly, as well as the collaboration of society to keep developing it. Is there any other project that you would like to accomplish with Google Grants? AIDA: It would be lovely if the Google Grants team could organize courses and workshops for NGO volunteers and employees in order to learn more about AdWords and other Google products. Would you recommend Google Grants to other NGOs? This week we wanted to highlight a Spanish organization, AIDA, that has been a grantee for 6 months. We hope the interview with AIDA below will help non-profits gain a better understanding of the non-profit sector and online media world in Spain. , Veronica introduced you to some of the policies which apply to AdWords ads. In this post, I am going to explain in a bit more detail a couple of easily made errors which can lead to your ads being disapproved when they are reviewed. While it can be really tempting to use some SnAzZy capitalization, or punctuation (!!!) to make your ads really stand out to users, you will also bring your ad to the attention of our review team. - Feel free to capitalize first letters of words, but don’t capitalize every letter (unless you’re using an acronym like UNICEF). When ads are reviewed, we don’t just look at the text, we also look at the page the user will see when they click the ad, which we often call the ad’s landing page. As a Google Grants advertiser, you may be asking for donations, and if you are, we require the landing page to make clear that donations are tax exempt. In the US, a notice of "501(c)(3)" status will serve this purpose. 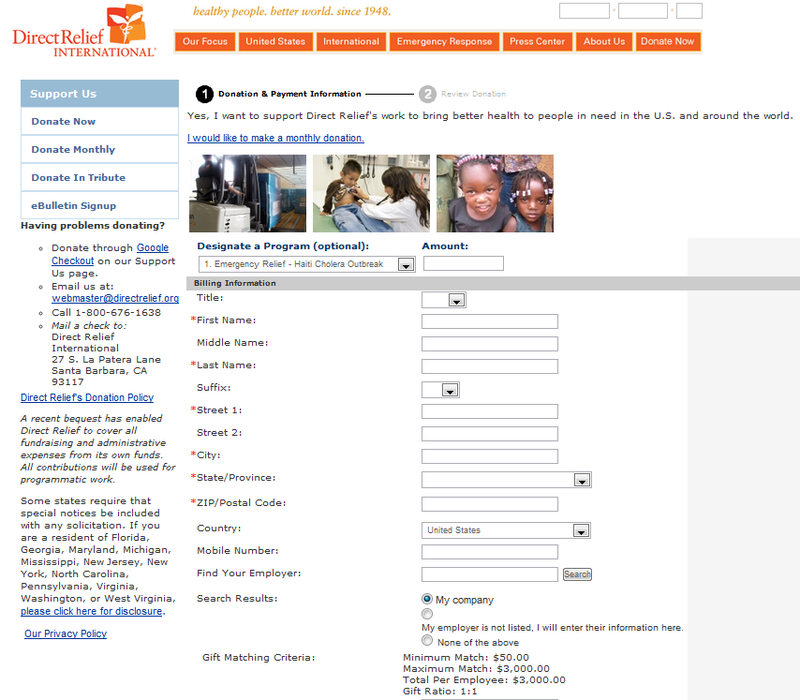 In other countries, it may be making sure that your registered charity number (or the local equivalent) is on your ad’s landing page. When we come across ads that do not do this, they are disapproved under our ‘solicitation of funds’ policy. My ad’s been disapproved, what now? Your disapproval email will contain a link to the relevant policy in our Help Center. Take a look at the description of the policy and consider why our reviewers have decided your ad doesn’t comply with this particular policy. When you make changes to your ad, saving the changes automatically resubmits a new ad to our specialists for review. Writing compelling ad text is a tricky process, and it can be frustrating to receive a disapproval email after carefully constructing the perfect ad. In a previous post, Veronica introduced you to some of the policies which apply to AdWords ads. In this post, I am going to explain in a bit more detail a couple of easily made errors which can lead to your ads being disapproved when they are reviewed. and compete for the NGO Impact Award. The Challenge is a global student competition open to any higher education institution anywhere in the world. The 2010 Challenge had over 12,000 students in 60 countries competing. This year, we would like the Challenge to reach even more people ... and we need your help in getting the word out! How can you help to get the word out? Professors or lecturers need to register on our website by mid-April in order for their student teams to participate, so contact any former or current professors you know to alert them to this great opportunity. The Academic Guide will provide professors with all the details they need to help them decide if the Challenge is right for their class. The Challenge is open to any university and any discipline around the globe, at graduate or undergraduate level. Registration is now open to professors till mid-April and students can compete from January 31st until the June 10th, 2011. Winners will be announced in July 2011. Together, student teams and nonprofits can make a lasting impact and learn about online advertising in the process. Thank you for your support! How can students hone their marketing skills and help an NGO at the same time? Sign up for the Google Online Marketing Challenge and compete for the NGO Impact Award. The Challenge is a global student competition open to any higher education institution anywhere in the world. The 2010 Challenge had over 12,000 students in 60 countries competing. This year, we would like the Challenge to reach even more people ... and we need your help in getting the word out! , has started using a new strategy to help their donors easily activate their employers’ gift matching programs at checkout. Basically, when a donor begins the checkout process, they are given the option to search for their employer from the database. 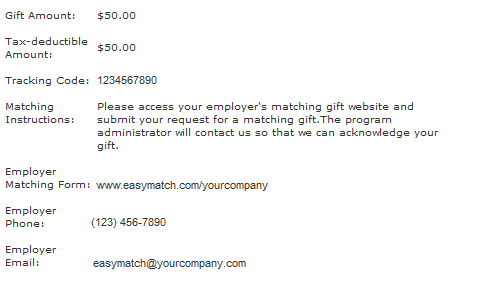 If a match is found, that employer’s gift matching program details are shown for the information of the donor. Once the donor completes the donation, the process for completing the gift match is shown so that they know what to do next in order to activate the matching funds. The process is far simpler from a donor’s perspective, and Direct Relief has kindly offered to share their experience with you so that you might be able to try this strategy for potentially doubling up each donation that comes through your online doors, too. Soup to nuts - what was the cost and time investment to get this up and running? Direct Relief: We purchased this module from a company called HEP Development Services in Leesburg, VA. (www.hepdata.com) The cost was less than $10,000 to purchase the module, and we contracted for multiple years. The time to implement was a few weeks with a little bit of back and forth, as we decided exactly how and where to implement it on our site. What's the process for purchasing the module and installing it? Direct Relief: Once you let HEP know how you want to use the module, they advise on how much it will cost and then produce the necessary code and send you a link. I built a page to host introductory content and the search box, then when a user searches their company, the results populate on a HEP-hosted page. It took some basic coding ability to implement on our site. 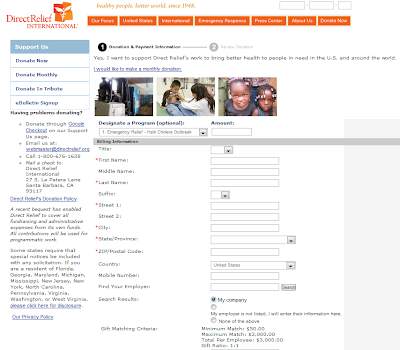 Also, we integrated it into our online donation form, which makes it really easy and convenient for donors to use. What process did you use for building out the company donation match database? Direct Relief: HEP maintains the company match database, and we provided names to them to see how many of our donors have the potential to have their companies match their gift. How much have you seen donations from company matches go up since you installed it? Direct Relief: None yet - it takes about three to six months for matching gifts to be disbursed from most companies (installed in November 2010). We think this could increase our matching gifts by about 20%, however. On a scale of 1-10, how helpful has this tool been for increasing donations compared to other tools you've used? Direct Relief: So far, we'd rank it an 8. Nothing's confirmed yet, but we're very hopeful that this will encourage donors to have their gift matched because it's so easy to use. Anything you think new users should know about it or consider before getting started? Direct Relief: Decide how and where you want to use this functionality on your site before you get started so you can communicate exactly what you're looking for to HEP. That streamlines the process. If you have strategies for increasing online donations that you’d like to share or just want to talk shop with other Grantees and non-profits, visit our Discussion Forum and start a conversation today. There are a variety of strategies for increasing online donations, and tapping into corporate gift matching is one that holds a lot of promise but is a little harder to get at since it requires extra work on the part of the donor and involves processes that can be hard to find or difficult to follow. One Google Grantee, Direct Relief, has started using a new strategy to help their donors easily activate their employers’ gift matching programs at checkout. Basically, when a donor begins the checkout process, they are given the option to search for their employer from the database. If a match is found, that employer’s gift matching program details are shown for the information of the donor.
. This one stop-shop of knowledge covers everything from setting up your account, to managing your bids, and even how to optimize your account to increase your rank on Google.com. The articles are organized by topics like Basics, Your Ad Performance, and Your AdWords Account so you can access them quickly. And if you can't find what you're looking for, don't fret! Just search for it at the top of any Google Grants Help Center page (we're really good with that whole search concept). Our second resource is built by you, made for you. The Google Grants Help Forum was created with all your questions (and answers!) in mind. Can't find what you're looking for in the Help Center? Perhaps others have the same questions too, and have posted them in our forum. This is the place to ask the community of Grantees anything you'd like. Sometimes the Google Grants team provides answers, but most answers come from YOU! Feel free to post a discussion, and see who answers in "My Discussions." If you answer many discussions, we'll show others that you're a star (!) and display the amount of discussions you've replied to on your profile. Also, if you find a discussion that particularly helps you, but can't read it 'til later, you can mark it and come back another time. Isn't crowd sourcing the best? So, get movin' on your easiest resolution this year and make your AdWords account the best it can be! In November, the Benelux Google Grants team had the pleasure to welcome more than 30 different non-profit organizations at the first ever Google Grants Day in Amsterdam. The attendees were a mix of existing grantees and non-profit organizations that were new to the Grants program. The day kicked off with a series of workshops and ended on a high note with insights into different aspects of online marketing from our 3 speakers. The workshops for our existing grantees began with a hands-on optimization session, where grantees got the chance to brainstorm with our AdWords specialists on how to maximize their Google Grant to meet their organization’s mission and goals. This was followed by a session on how to create exposure and awareness through YouTube and a workshop on how non-profit organizations can get the most valuable information out of Google Analytics. For the organizations new to the Grants program there was a special surprise: we made sure that they would leave the Amsterdam office as the proud owners of new and shiny Google Grants accounts! During their sessions these non-profits got the chance to set up their account, get acquainted with the AdWords interface and learn all about basic optimization. Suffice to say that these new grantees left the Grants Day happily surprised and extremely content. After these product-focused and practical workshops, the speaker sessions offered the grantees a chance to think about online marketing from a broader point of view. Topics covered by speakers from Google ranged from Search Engine Optimization and Google Webmaster tools to Google Earth Outreach and the work that Google does through Google.org such as Google Crisis Response. Then, Jeroen den Tex, Chief Marketing Officer at Red Cross the Netherlands, enlightened us with insights into how the Red Cross puts the online landscape to good use. Following the speaker session, the grantees had the opportunity to get to know their fellow grantees while enjoying a bite to eat. We were happy to learn that our grantees found it very useful to be able to share advice and best practices with other grantees, and we hope that this will encourage valuable collaboration between non-profits in the future! Overall, the attendees were very eager to learn more about Google Grants and Google for Non-Profits products and tools. We would like to thank all the grantees for attending and all the Googlers for helping us to make this day a huge success! We hope to repeat this in 2011!